When I woke up early in the morning hours I noticed the Morning Star, better known as the planet Venus blessing me from above. I squinted my eyes and let the planet starlight fracture into rays of light that bathed my mind in the silence of the wee morning hours. I was told that it had been raining in Belgium all summer long but when I woke up in the morning the sun was shining through the window. I enjoyed a morning meditation of sun beams warming my face. As I bathed in the sun I had a beautiful vision. The face of a Black Madonna came to me. She wore a beautiful golden crown with many colored jewels that illumined her face. It looked like pictures of Our Lady of Czechoslovakia I had seen, but I later understood who had appeared to me. All my stories of the Black Madonnas had lit a fire in our friends heart we had been staying with and after a few days she took us to Halle to visit the Dark Virgin at the Church of San Martin. Halle is an ancient Flemish city located next to the River Zenne. This town is in the center of an agriculture area. Some of the favorite homes of Black Virgins are in farmlands. We drove to Halle, passing freshly ploughed fields being made ready for a newly planted winter wheat crop. Cornfields were ripening in the early autumn sunshine and rows of Swiss chard and greens could be seen for miles. We arrived at the church whose outside was in process of restoration. The church had its origins in the 12th century. It was built in the traditional gothic style complete with gargoyles. Royal family lines were buried here. They also had done pilgrimages to San Martin. When you entered the cathedral you could readily recognize this in the details of the artwork that breathed the air of royalty. I first made my way to a small cove at the right side of the altar. Since I saw many votive candles lit, I assumed the Black Virgin must be there and indeed she was. She was enshrined in a blazing gold yoni. She was black as the midnight sun. She held the Christ Child suckling her breast. It is unusual to see the Madonna and Child in the Church. Her Presence was powerful and as I stared at her the light began to glow golden around her. Cannon balls were placed at her feet, since there is a legend about her Presence saving the city in 1580 from a siege of war. It seems Philip of Cleef wanted to take over the city of Halle. The legend says the The Black Madonna caught the Cannon Balls in her lap, thus saving the city. I meditated on the Madonna’s Presence and began to reflect what the deeper message of this shine was. We all have emotional cannon balls in our life. The outer wars we are experiencing on this planet at this time are a reflection of the inner wars we collectively have going inside ourselves. There are dormant cannon balls that live in our emotional bodies, which are waiting for the right moment to explode for the least likely reasons. When we have a big emotional reaction to someone or something in our life without just cause we are most likely reacting from events of the past. Suppression and unexpressed anger slowly builds over time, needing a release. Our minds become fogged and we might find ourselves over reacting in situations without truly understanding the roots of our reactions. A wise Native American teacher once talked about the secret of sound. He said when the world collectively has too much suppressed emotions only a large sound can release the collective suppression and that sound is the sound of bombs dropping. We have come into a time that we all must awaken to our suppressed emotions and find a non-violent way of releasing our individual suppressions to not add to the human collective anger. The more we clear our inner turmoil, the more the outer picturing of the state of world affairs will begin to find peaceful solutions. This will take a massive amount of people taking personal reasonability to create peace on this troubled planet. We will not have world peace until enough of us experience inner peace. The Black Madonna’s message sank deep into my consciousness. I got up from my meditation and began to walk around the church. I went to the main altar and there, hovering high above the altar, was the Madonna of my visions. I realized the church had another Black Madonna. She had a Golden Crown of jewels and she was suckling a crowned Christ Child. Her face was of ancient wood. It had not been the Lady of Czechoslovakia in my vision, it was the Black Lady of Halle that had called me. The way that the church was made you could circumambulate around the main altar. Behind the main altar were coral-colored alcoves with different icons. Mary Magdalene was present. Saint Roch and others could be found. 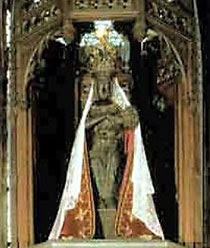 The Lady of Halle once belonged to St. Elizabeth of Hungary and she was passed down to her daughter Sophia of Thuringia. It was then passed down the royal families and finally was given to Countess Mechtildis of Holland who donated the Madonna to the church in Halle. A legend of Halle speaks about a tree that once stood on the River Zenne. A statue of the Virgin was venerated in this holy spot. The tree stump can still be found in the Crypt of San Martin. This tree stump most likely has its real roots in the ancient Celtic worship. The Celtic tribes often worshiped the Goddess in the form of trees. It was the darkest new moon of the year and I had traveled to Belgium to meet my women’s group that evening for chanting. We sang Ave Maria over and over again until our voices began to weave into a haunting drone. The evening was good but the next day’s meeting was equally rewarding. A group of 11 women rode in a caravan to our Lady of Halle, the Black Virgin I had visited a few months before. When I first had visited Belgium, the land spoke to me with visions of swan maidens, spinning flax the color of moonlight and the Goddess Freya and her enchanted cats. The forgotten memories lay dormant in the earth. But also the face of the Dark Madonna of Halle came to me through vision. The women gathered just beyond the doorway of the church, preparing themselves to enter the sanctuary of the Madonna, for there are two Madonnas in the Basilica of Halle. I looked down the isle of the church to see the oldest icon of our Lady of Halle hovering high above the main altar of the church. It was hard to make her face out from such a distant but with the help of my trusty digital camera I could see her ancient face clearly. She was old and the wood of the icon was weathered like an old woman who had seen many moons. She was the dark goddess, suckling the baby Christ child at her breast. She did not look like the Virgin Mary but something that dated before time itself. But who was this ancient Goddess behind the Black Virgin of the Catholic Church? It was the Mother Holle, the old pagan Goddess. Mother Holle was associated with the darkest nights of winter. She rode on the winter winds bringing purification to the land. This winter purification caused the land to bear good harvest and brought abundance to the people. Frau Holle name means Beneficent One. She was the protector of the hearth and was gifted at spinning of flax. Her sacred objects were the distaff, flax, coal, the goose and a feathered quilt. The distaff, a tool of spinners, was used to keep the flax in place before it was spun into wool. Many times the distaff was used by wise women as a magic wand to bring good blessings to one’s life. The face of the second Black Virgin of Halle is smooth as glass and black as the coal. She resides in a small nave that is enflamed with votive candles too numerous to count. Her coal blackness kindles the memory of the gifts of the Goddess Holle. The sacred time of the Old Goddess Holle was winter, when it was time to honor ancestral roots. She could be found in the forest, grottos, fountains and cross roads. She brought her blessings to the new-born and to the dead that were leaving this world. You could see her Presence in the Icon above the main altar. Her face was ancient but she suckled the babe in her arms for she cradled both birth and death. She flew across the skies at Winter Solstice nights with her spiritual host who rode brooms and carried the harvest sickle shaped like the crescent moon. But she also appeared as the Virgin in the holidays of Saint Lucia when young girls dressed in white with a crown of evergreens and candles balanced on their heads. They served sweet breads to their family and neighbors, bringing the light on the shortest days of the year. The Goddess Holle was known to initiate young women into the mysteries of womanhood. She brought blessings to those who proved themselves from their acts of compassion, generosity and forgiveness. Grimm’s fairytale connects Mother Holle with the old woman who lives in the forest with her flock of geese. She is associated with Mother Goose and Goosefoot Bertha. When she shook her goose feather quilt the snow would fly. An old proverb says “The Old woman is feathering her geese” when the snow falls. Mother Holle brought blessings to the fields of flax and the Spinner. Goddess Holles power of Spinning reflects the creation of matter and what is the Black Virgin. None other then atoms of light that have awaken in Matter. Consciousness that have awaken in our human form. The women walked to the nave which housed the Black Virgin of Halle. We gathered together and huddled as a group around the Black Virgin. We raised our voices together singing Ave Maria, honoring her Presence as deep as our ancestral memories in our bloodlines. Each one of us found our place in the wooden pews and sat in the silence of our own experience before the awesome presence of the Virgin. One by one I took the hand of each woman and stood her before Our Lady of Halle. Tears of remberance flowed down many of our cheeks. The Sacred Presence surged through our bodies as the purification of the Goddess worked her magic of initiation. We released what was not needed any longer in our lives. This looked different for each woman, according to her soul’s needs. Letting go became easy – our hearts softened in the Black Virgin’s Presence. The Black Goddess teaches us the way of trimming our lives of unwanted habits or belief systems that no longer serve our growth. Just as the winter wind releases the leaves of autumn from the trees. Her voice can be gentle when we listen to her closely. But when we ignore the gentle voice of the Dark Goddess she comes as a strong winter storm into our life experience. Her violent storms removes away the dead wood from a tree. Mother Holle hides her memory under the robes of Maria in the Catholic Church in the Black Virgin of Hale. But you can still feel her presence in the coldness of the winter winds on a dark Solstice Night. You can make offerings for Mother Holle for Solstice Night. You can leave small pieces of Flax, honey, bread or a chunk of coal to bring the blessings to the spirit of the land. The village St Martin de Belleville was named after a Hungarian saint who lived in France and once served as a Roman soldier. It was said he cut his cloak in half and gave it to a beggar during freezing weather. That night St Martin had a dream that Jesus came to him revealing he was the beggar that Martin had given his cloak too. Soon after his experience St Martin left the Roman army to join a group of ascetic monks. He was known as an exorcist priest that read special prayers over people possessed by evil spirits. He cared for the sick, the poor and the starving. He became so well known in the prayerful art of exorcism that the church want to make him a bishop. Not wanting such involvement he hid himself in a barn of geese. The birds honked so loud that it gave away his hiding place to the Church’s Fathers. St. Martin feast day was November 11 he became the saint of tailors and wool weavers because of the sharing of his cloak. He also resided over inn-keepers geese and wine making. It was on his feast day that the first tasting of new wines would be presented after the autumn grape harvest. St. Elizabeth was the Queen of Hungary. Her icon holds a loaf of bread and an apron of roses. She was married to a cruel and selfish king. She would secretly go out and feed bread to the poor in which her husband had forbid her to do. One day he found her in the streets she hid her bread in her apron to hide from the king’s eyes. He demanded to see what she was carrying in her apron and when she opened her apron the bread had been transformed into roses. This legends has it’s roots in a more heretical hidden story. The roses represented the rose-line or”bloodline” of the Kings of France that claimed being the lineage of Magdalene and Christ. The last Merovingian King was killed Dagobert II by his Godson on Dec.23, 679. Even though the Merovingian Kings had been removed from power the Merovingian Princess were still alive. It was very common practice through out Europe to married into the Merovingian bloodline through the Merovingian Princess.